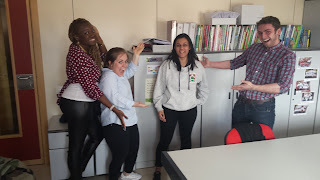 Ja fa uns dies que tenim aquí amb nosaltres a la Rhea, la nova auxiliar de conversa que ha vingut de Glasgow per formar part del Progama d'Auxiliars de Conversa que tenim a l'escola. Aquí teniu unes paraules que ens ha dedicat per presentar-se i com podeu veure a la imatge, ha estat molt ben rebuda. I am from Glasgow, Scotland and I studied Law in Edinburgh, Napier University. I have visitied Spain a few times before and wanted to come back to learn more about this beautiful country. I love playing sports, drawing, painting, cooking and going out with friends. I am excited to work at this school and gain some teaching experience.